I also wanted to know if there was a toggle button I can create to "Collapse All" sections and to "Expand All" when pressed again. I don't think it is a good idea to mess with the internals of QuickBase Dynamic Form Rules. But if you are not using Dynamic Form Rules you could put a series of these statements in your module.js and automatically close the sections that are open by default. However the next time you revisit the page QuickBase will remember the state you left the sections in and will proceed to toggle them. 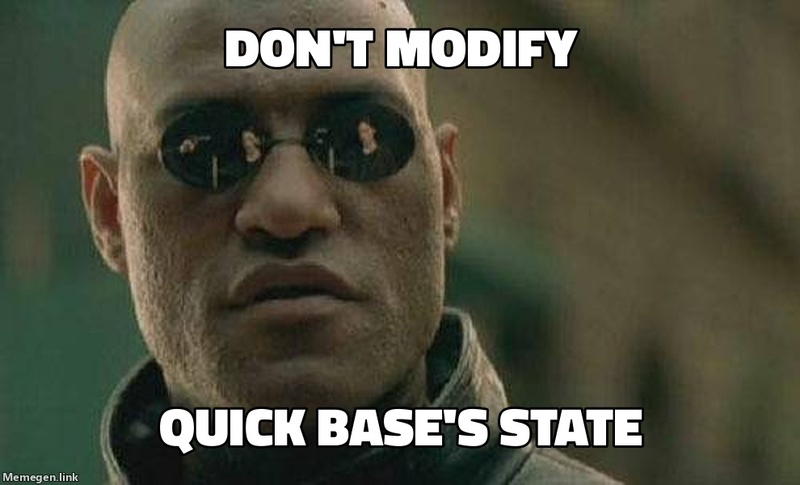 So maybe my answer will give you a hint at what to do but I do not really suggest you monkey around with the internal state of QuickBase's forms unless you are some type of mad hacker. If you do this your code will surely fail at some point in the future when QuickBase changes their page architecture but since you only do this if you are a mad hacker you will have no problem adopting to the abrupt change. What is really needed is a "contract" or API that would allow you to modify the form / page to enhance its functionality without creating conflict with QuickBase's native functionality. Dan, are you a mad hacker? Just curious where you draw that line. I will count on you to keep tabs on QuickBase Security for us. A new and serious vulnerability has been identified in a popular software library. How do we know it's serious? Because the vulnerability has a clever name, sweet logo, and as much hype as we can generate from a single web page. You are vastly more likely to misplace your password than to have security episode with QuickBase.